PRACTICE MAKES PERFECT Members of the Ann Sobrato High School marching band, seen during an April 5 session, can opt to take a PE/Marching Band course for physical education credit next school year. Chambers of Ann Sobrato High School. The class is held during the school day. “If it opens the doors to future creative opportunities (for our students), then that’s great,” said Board President Mary Patterson. She noted that parents of high school seniors who won’t even be able to take advantage of the new pilot class spoke in support of it at the April 2 meeting. at 5.23 percent interest rate. The average annual tax rate for property owners would be $52.19 per $100,000 assessed property value; or • A $280.5 million bond with four issuances of about $70 million every three years and a repayment period of 30 years at 5.20 interest rate. The average annual tax rate for property owners would be $52.61 per $100,000 assessed property value. CITY COUNCIL The Morgan Hill City Council will consider the impact fee rate study and adopting its recommendations at the April 17 meeting, which starts 7pm at council meeting chambers, 17555 Peak Ave.
aid—including a tourniquet to slow the victim’s bleeding—and secured the scene for emergency medical personnel, Norman said. When paramedics arrived, the victim was transported to a local trauma hospital. said. Police recovered several bullet casings from the scene. Officers think the man was shot while he was riding his bicycle on Tilton Avenue. Detectives continue to investigate the shooting and are asking for help from any additional witnesses. Business owner? Ask about our business savings rates. Talk to a banker for details. Offer expires May 31, 2019.
set three new parameters for the 2019 plan, one of which is, “Minimize service cuts in South County.” The final plan and recommendations will be presented to the VTA board on May 2 at a public meeting. Following the plan’s adoption, changes will begin “with the start of BART service to Santa Clara County,” which is expected to happen at the end of 2019. Don Larkin toward Norman with their hands up, Norman accidentally fired a round into the ground as he was holstering the weapon with his left hand. A fragment of the bullet bounced up and hit one of the teen girls in the eye. Another new state law that amends the PRA—AB 748—will apply more clarity to the openness of police body cameras when it goes into effect July 1. This law will require police agencies to make officer body cameras available to the public after 45 days. A family tradition - Now in our 40th year! 212 Tennant Ave. HWY 101/Tennant Ave.
n the first day of kindergarten, my heart raced. I was just 5, about to be thrown into a world I knew nothing about, and I was terrified. I found I was immediately welcomed to my class and came to know of the rare beauty found in school. My fear was replaced by love and comfort. In the fifth grade, my teacher sat us down to talk about guns. It was December 2012, and the shooting at Sandy Hook Elementary had just happened: 28 dead. Our teachers did the best they could to explain to us what had happened— but how do you explain such tragedy to a child of only 10? It was the first time I had heard the words “shooting” and “school” in the same sentence. I felt fear again—not fear of the first day of school but of danger surrounding me as I played in the schoolyard. My sense of comfort was shattered. Now, seven years later, that shock and fear has been replaced by a numb sense of awareness. Since Sandy Hook, there have been at least 239 school shootings. In 2017, 39,773 people were killed by guns in the U.S. The U.S has a gun problem, and that problem has permeated our schools. It feels as if we are trapped in a constant cycle of school shootings, becoming desensitized to the tragedy that surrounds us. It feels as if there is nothing we can do. But there is. I ask you to feel: Feel the shock, the sadness, the outrage. it feels as if we must turn off our emotions in order to preserve our sanity. But we cannot lose hope, we must continue to work to uphold the true ideals of life, liberty and the pursuit of happiness. Capitol Hill feels far away, but as a community we can work to eliminate gun violence. Prevention starts within our schools. Many a time, the perpetrator of a shooting is a young person, a recent or current student. Hill. This is an edited version of a speech that won a local American Association of University Women contest. Funding that schools receive for counseling is insufficient. The American School Counselor Association recommends a counselor per every 250 students; California’s ratio stands at 1 for every 760. Outreach makes a difference. Schools in Los Angeles have seen high success from outreach by county mental health professionals, school staff, and law enforcement to identify students that pose potential threats to their school environment. This outreach does not stem from aggression or demonization of at-risk students, but instead the goal is to provide these students and their families with the proper help and services they deserve. We must work with school boards to ensure this type of outreach in all our schools. We must also strive to teach our children necessary social and emotional skills. Communication and conflict resolution can be used as vital skills for students to create connections with others and instill in them empathy for those different from themselves. Communities can work to provide safe spaces for youth, such as teen centers, to provide them with a compassionate and nurturing environment designed to help them grow. And we can advocate. We can turn our anger into action. We can walk, we can write to our representatives in Congress. We can advocate through social media, and we can vote. We students want our voices heard. We want to see ourselves reflected in the decisions made by our elected officials. We want to live, knowing our lives won’t be cut short by an act of senseless violence, knowing what beauty it is to truly learn and live once again in comfort. LETTERS POLICY Letters to the Editor of the Times must be signed with a real name, for publication, and the sender must also add a phone number or email address plus city of residence, for identification purposes only. Letters become the property of this newspaper, and may be edited for length and taste. Letter writers should avoid obscenities and personal attacks, and keep letters to under 300 words. Email: editor@morganhilltimes.com. Morgan Hill Times (USPS # 362860) is published every Friday by New SV Media Inc.
We encourage you to share your opinions. Letters are limited to 500 words and are subject to editing. Please include a phone number for verification purposes. Email to editor@morganhilltimes.com or submit your letter online at morganhilltimes.com and look under reader submissions in our navigation bar. DINNER TIME Morgan Hill resident Kristi Murnin enjoys dinner at Opa! on opening night, April 8. The Greek restaurant is located at the intersection of Monterey and Third streets in downtown Morgan Hill. Golden State Brew & Grill reopened April 6 after a six-month remodel project that upgraded the restaurant and brewery. The business, located at 7560 Monterey Rd, Suite 100 in downtown Gilroy, celebrated with a party featuring live music. Golden State Brew & Grill originally planned on a December opening date, but wildfires in Northern California pushed back needed upgrades from Pacific Gas & Electric, according to a statement on the business’ Facebook page. The Gilroy Downtown Business Association is hosting its fourth Downtown Business Sidewalk Sale and Craft & Vendor Fair on May 18. The event takes place 10am-3pm throughout downtown Gilroy on Monterey Street. The fair will feature more than 50 vendors on Fifth Street between Monterey and Eigleberry Street. For information, visit tinyurl.com/yxbdjasw. Morgan Hill location, 17290 Monterey Rd. In a statement, Opa! officials said they were “very excited to welcome the community.” “We thank you for your continued patience and excitement while we worked through the construction process and are so very happy to finally open the doors,” the statement read. The restaurant provides Greek dishes at a variety of locations in the Bay Area. For information, visit www. opaauthenticgreek.com. Send business news to Erik Chalhoub at echalhoub@ newsvmedia.com or 408.842.9505. Come In And Enter Our Drawings to Win a Variety of Prizes Like Meat & Wine! valid and trigger a referendum vote on the council’s unanimous decision, it would need 2,354 signatures, or 10 percent of registered Morgan Hill voters. The county registrar previously projected the petition has 3,176 valid signatures. “Due to the importance of this matter, the City of Morgan Hill has requested that the Santa Clara County Registrar of Voters perform a full count to be completed within 30 days,” said Tobin. “The results of the full count will determine the next steps.” The petition has been the subject of controversy between the project developer, existing hoteliers and the city. The council unanimously voted Feb. 6 to allow two hotels to be built: a Fairfield Inn and Suites and a Hilton Home 2 Suites. The County of Santa Clara proudly welcomes Oâ&#x20AC;&#x2122;Connor Hospital, St. Louise Regional Hospital and De Paul Health Center to our network of care. Together with Santa Clara Valley Medical Center, these facilities are helping to grow our healthcare services for all valley residents. census taken in 2017. A new homeless census was taken in January and is expected to be released next month. Local agencies expect the numbers of people—and families— without homes in and around Gilroy, Morgan HIll and San Martin will increase. After months of misfortune, including a broken wheelchair, the Bataz family has new optimism. For two months, they lived at Santa Clara County’s temporary shelter for homeless families at the Arturo Ochoa Migrant Center on Southside Road in southeast Gilroy. The center shut its winter shelter operation March 25, forcing 35 families to leave to make way for the next seasonal tenants—migrant farm workers arriving for spring planting. Abode Services, a leading Bay Area provider of services to people without homes, stepped in and spared the Bataz family from a return to more long nights sleeping in the van in a Gilroy shopping center parking lot. The nonprofit agency was able to find the family temporary shelter in a local motel, and is working to find the family of five a more permanent shelter. son Alex are greeted by Vicky Martin, of the St. Joseph’s Family Center. for St. Joseph's Family Center, says a half dozen families were turned away in January. “Many of them are back living in their vehicles,” Martin adds. Saint Mary Parish 11 First Street, Gilroy • 408.847.5151 Holy Week is the Christian Story in 7 days. Come live it with us! ¡La Semana Santa es la historia Cristiana en siete días. Ven y vívela con nosotros! Living out of the van has been isolating, sometimes depressing, she admits. “In the beginning I had a little rough time, when Carlos had to go to work and I wa“Sometimes, depression kicks in a little bit in the morning—but apparently, people don’t think that the homeless should have depression, ‘because you don’t have no worries about paying bills.’ It’s been thrown in our face a couple of times. Sometimes it gets rough,” the mother of three confides. “But as long as you respect people, respect comes back,” she adds. “For me, I’ve met other moms, and they don’t even take their kids to the park, because they’re homeless. Me? I am there all day.” Carlos has faced different challenges. He still struggles with English, speaking Spanish to his family. from left: Alex, Faviola, Bruce, Destiny, Carlos, and their dog Rocky. can find a dollar to get them a kite. It’s not that expensive to buy a kite.” Outside St. Mary’s Church, after the dinner, Carlos patiently shows an excited Bruce how to fly his new kite. “I like my papalote!” shouts the smiling secondgrader as the kite soars high over Church Street. a refund every year have seen it eliminated, she said. Those who fear having to owe money tend to wait longer to get their taxes filed, causing an influx of clients turning to tax professionals in the days leading up to the deadline, she added. remain open until 7pm, with the last collection at 3pm. The Gilroy, Morgan Hill and Hollister post offices’ last pick up will remain at 5pm To file an extension, visit www.irs.gov/forms-pubs/ extension-of-time-to-fileyour-tax-return. Milgard Trinsic® Series Vinyl Windows & Doors. Maximum views with contemporary style. full lifetime warranty for added peace-of-mind. ® Series ® Series Milgard Milgard Trinsic Trinsic Vinyl & Doors. Vinyl Windows & Doors. Available from South ValleyWindows Windows Maximum Maximum views with contemporary views style. with contemporary style. 315 First Street, Gilroy. be used for capital improvements and is controlled by the school district and not the state or federal government. The first $55 million (called Series A) went to projects at school sites throughout the district, including work at the Loritta Bonfante Johnson Education Center on Tilton Avenue, San Martin/Gwinn Environmental Science Academy and Paradise Valley Engineering Academy. district’s director of construction and modernization, in his April 2 report. “If the board concurs with staff ’s recommendation, staff will begin initial outreach and return with any consultant agreements and analysis as needed for the 2020 bond for board consideration.” The 2017 Facilities Master Plan identified nearly $700 million in program needs. That figure jumps to $867 million by 2020, according to the staff report. through the secondary curriculum council process that includes discussion at the site leadership level, review by council members and a one-week advisory balloting process. Courses with favorable recommendations are further reviewed by Educational Services to prepare a recommendation to the governing board. The PE/Marching Band course was one of two new courses approved by the school board April 2. The other was advanced video production, a Career Technical Education class developed by William Row at Live Oak High School. 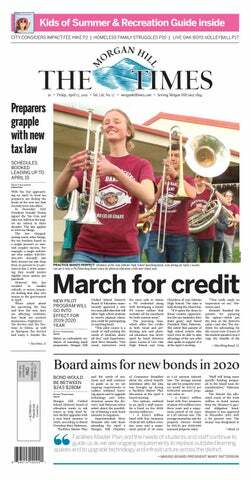 Both classes will begin at the start of the 2019-20 school year.photo on jump page: MARCH ON Ann Sobrato High School marching band members march outside on campus April 5. Next year, they can receive physical education credits in a new PE/ Marching Band pilot course. MARCH ON Ann Sobrato High School marching band members march outside on campus April 5. A Taste of Loma Clara! Please join us to celebrate the grand opening of Morgan Hill’s newest luxury senior living community, Loma Clara! Enjoy an evening of music, along with delicious food and wine pairings from two local wineries, Morgan Hill Cellars and Guglielmo. While you are here, you will discover more about why Loma Clara Senior Living is full of vibrancy, amazing care and exceptional service. Enter our raffle for a chance to win a $1,000 two-night stay at the St. Francis Hotel in San Francisco, PLUS a $1,000 gift card to enjoy the city! Please RSVP by calling 669-258-3500. We look forward to seeing you there! WiTh PoWer SeATS, keyleSS oPen & STArT! *THIS IS THE CHEVROLET CONQUEST INCENTIVE FOR CURRENT OWNERS/LESSEES OF A 2005 OR NEWER NON GM (I.E., NON-BUICK, CADILLAC, CHEVROLET, GMC, HUMMER, OLDSMOBILE, PONTIAC OR SATURN) PASSENGER CAR OR TRUCK WHO PURCHASE ONE OF THE ELIGIBLE NEW AND UNUSED MODELS. **Must finance through GM Financial (GMF) subject to credit approval. 3 @ this net price vin 715227, 720168, 719927 *Residency restrictions apply. **Must finance through GM Financial (GMF) subject to credit approval. *THIS IS THE CHEVROLET CONQUEST INCENTIVE FOR CURRENT OWNERS/LESSEES OF A 2005 OR NEWER NON GM (I.E., NON-BUICK, CADILLAC, CHEVROLET, GMC, HUMMER, OLDSMOBILE, PONTIAC OR SATURN) PASSENGER CAR OR TRUCK WHO PURCHASE ONE OF THE ELIGIBLE NEW AND UNUSED MODELS. *Residency restrictions apply. **THIS IS THE CHEVROLET CONQUEST INCENTIVE FOR CURRENT *THIS IS THE CHEVROLET CONQUEST INCENTIVE FOR CURRENT OWNERS/LESSEES OF A 2005 OR NEWER NON GM (I.E., OFF MSRP OWNERS/LESSEES OF A 2005 OR NEWER NON GM (I.E., NON-BUICK, CADILLAC, CHEVROLET, 5 to choose From at this savings msrp range NON-BUICK, CADILLAC, CHEVROLET, GMC, HUMMER, OLDSMOBILE, PONTIAC OR SATURN) PASSENGER CAR OR TRUCK WHO GMC, HUMMER, OLDSMOBILE, PONTIAC OR SATURN) PASSENGER CAR OR TRUCK WHO $36,855 to $42,985 depending on equipment. PURCHASE ONE OF THE ELIGIBLE NEW AND UNUSED MODELS. **Must finance through GM Financial (GMF) subject to credit approval. PURCHASE ONE OF THE ELIGIBLE NEW AND UNUSED MODELS. Gm Financial standalone apr program, monthly payment is $13.89 for every $1,000 you finance. example down payment: 4.3%. must finance with Gm Financial. some customers may not qualify. not available with lease and some other offers. 2019 ChevroleT SilverADo DouBle CAB 4x4 TrAil BoSS eDiTion! *Must finance through GM Financial (GMF) subject to credit approval. **THIS IS THE CHEVROLET CONQUEST INCENTIVE FOR CURRENT OWNERS/LESSEES OF A 2005 OR NEWER NON GM (I.E., NON-BUICK, CADILLAC, CHEVROLET, GMC, HUMMER, OLDSMOBILE, PONTIAC OR SATURN) PASSENGER CAR OR TRUCK WHO PURCHASE ONE OF THE ELIGIBLE NEW AND UNUSED MODELS. *THIS IS A CHEVROLET CONQUEST INCENTIVE FOR CURRENT OWNERS/ LESSEES OF A 1999 OR NEWER NON GM (I.E., NON-BUICK, CADILLAC, CHEVROLET, GMC, HUMMER, OLDSMOBILE, PONTIAC OR SATURN) PASSENGER CAR OR TRUCK WHO PURCHASE. **Must finance through GM Financial (GMF) subject to credit approval. $10,777 Net Savings off MSRP! Save MORe GReen at GReenwOOd! Net Sale Prices and Factory Rebates in lieu of Special Finance, Lease and Fleet offers. Vehicles pictured are for display purposes only and may vary slightly from the actual vehicle. All vehicles subject to prior sale. Prices do not include government fees and taxes, any finance charge, any dealer document processing charge, any electronic filing charge, and any emission testing charge. Not responsible for typographical errors. Residential restrictions apply. Offers expire close of business 4/14/2019. *Prices do not include government fees and taxes, any finance charge, dealer document processing, electronic filing charge and any emission testing charges. Expires 4/15/2019. 408-842-0400 Under New Ownership Under New Managment! *Must finance through Hyundai Motor Finance (HMF) subject to credit approval. **Residency restrictions apply. *Must finance through Hyundai Motor Finance, subject to credit approval. SOUTH COUNTY HYUNDAI PRE-OWNED VALUE PRICING! WOW! H URR T HE SE Y OV E R , PR A RE A M IC E S A ZING! BIGGEST PRE-OWNED SALE! CARS STARTING AT $4,888!! 2019 KONA EVâ&#x20AC;&#x2122;S ARE HERE! All prices exclude government fees and taxes, any finance charges, any dealer document processing charge, any electronic filing charge and any emission testing charge. Residency restrictions apply.. See dealer for complete details. V Vehicles ehicles pictured use for display purposes only and may vary slightly from the actual vehicle. All vehicles subject to prior sale. Not responsible for typographical errors. Sale prices end 4/15/2019. often have to attempt an attack from beyond the 10 foot line. Gonzalez has had some success in that, utilizing tips and pushes to keep opponents off-balance. Gonzalez estimated that he recorded three or four points in the 15 to 20 attacks he had against Independence. Gonzalez aims to finish the season strong and go straight into club season, where he hopes for another marked improvement. Gonzalez has a goal to record 50 digs this season, and he was on pace to accomplish that through the first four matches. Elia, Mason Binder and Matt Bronson. For the 12U team, some of the top players include Tyler Lang, Aidan Cote, Bennett Nishikawa, Dylan Fisher, Kevin Oselinsky, Gary Rosyski, Zach Binder, Sam Ellingson and Brad Ledwith. For the 14U team, some of the standouts include Bryan Carrol, Colby Allen, Dylan Henry, Ryan McDonald, Max Reid, Tanya Carrol, Matt DeSilva, Luke Richey and Mateo Norman (some of the names are on both teams as sometimes players compete in a higher age group). For Luke Richey, playing lacrosse has become his No. 1 love. He started playing the game three or four years ago after one of his best friends, Ben Ledwith, and Ben’s brother, Nolan, expressed interest in it. Now it’s something the boys do year-round, rarely going more than a couple of days without at least cradling or passing the ball at a neighborhood park. “I was really excited to try out the sport with my friends,” Richey said. “I think my dad also told me to try it out, and it seemed exciting.’ Richey plays for the Outlaws and the CaliLax All-Star team that is headed to Canada this summer to play in a box lacrosse tournament (look for a future article on that as the start of the tournament gets closer). Richey has been enjoying his time on the Outlaws, citing a couple of reasons, starting with having a good rapport with his teammates, especially Ben Ledwith. the South County Outlaws youth lacrosse program based out of Morgan Hill. on the West Coast—the change in attitudes about the game have resulted in the sport flourishing and giving more kids a chance to play at all levels and every age group. Brad Ledwith expects the sport to continue a steady growth locally. Your Subscription Helps Support Local Journalism You deserve to be well informed about local issues that matter. Support a better community and real journalism with a subscription to your community newspaper. Your subscriptions helps us pay for the cost of printing our paper and delivering it to your home. Subscribers are guaranteed a replacement edition if a delivery is ever missed. 3 ways to subscribe: 1 Call 408.842.2327 for credit card payment. All vehicles are subject to prior sale. All prices exclude government fees, license, registration, taxes, finance charges, dealer document processing charge of $80 on all vehicle purchases and electronic filing charge and any emission testing charge on used vehicles not included. Financing available on approved credit to qualified customers and not all customers will qualify. No cash payment made to customer. New vehicle purchases include two year or 25,000 mile of Toyota Care Service. Toyota Care covers normal factory service for two years or 25,000 miles, whichever occurs first. Excludes those items in the vehicle maintenance guide under special operating conditions. Toyota recommends service every six months or 5,000 miles.Vehicles serviced based solely on time will receive up to four services under the Toyota Care Plan. See Gilroy Toyota for details. Offers expire close of business on 4/15/2019 and are subject to stock on hand.Vehicle images are a representation and may differ from actual model in stock. ess Lujan, 67, died on February 28, 2019. He was born on September 24, 1951 in Fort Ord, CA. He grew up in Hollister, CA before moving to Southern California to work as a Master Mechanic and Quality Engineer in the Aerospace Industry. In 1993, he made his home in Washington State. In his early years, Jess loved working on and racing cars. Later on in life and mindful of his native heritage, he created a series of maps title “Portrait of Indian Heritage” along with a directory of tribes across the US. He always maintained his drive to work on a wide array of projects and used his knowledge and skills to help out friends, neighbors and family. Jess is survived by his wife, Sunya; his mother, Lupe; his brother, Ted; his sister, Anna; his son, Brennan; his daughter, Valiska; and his step-daughter, Gwen. oe enjoyed living on his ranch in Hollister for the past 25 years moving from Oakdale. He retired when he was 32 years old to operate his ranch and manage his real estate, spending time with his horses and animals. Over the years Joe rode western trail, English, jumpers, fox hunts, dressage, polo, and cutting. Joe truly loved his horses. Joe had a large family in Mountain View and left them all mourning his passing. Cusimano Family Colonial Mortuary helped the family with Joe’s service. Donations in remembrance of Joe can be given to animal shelters. A celebration of his life will be held at a later date. ur mother, 104 years old, entered into rest, in her home, in Gilroy, CA. She was preceded in death by her husband, John V. Vasquez, in 2000. Loving mother of Lillie Fuentes, Tommy Vasquez, Fred Vasquez and Jennie Susan Vasquez-Morse. Also survived by grandchildren, great grandchildren, great great grandchildren, nieces, nephews and her sister Mercy Vasquez of Puyallup, Washington. Visitation will be held on Sunday, April 7, 2019 at 3:00 pm, Rosary at 7:00 pm at Habing Family Funeral Home, 129 4th Street, Gilroy, CA 95020. Phone: 408.847.4040. Funeral Mass will be held Monday, April 8, 2019, 10:00 am at St. Mary Church, Gilroy. Burial will be at St. Mary Cemetery. For online condolences please go to http://www.habingfamilyfuneralhome.com. arbara Jean Marymee Tuttle, age 88, passed away after a short illness on January 13, 2019 surrounded by her family at her home in Aloha, Oregon. Born April 6, 1930 in Gilroy, CA to William M. and Dorothy Fellom. She was a 4th generation Gilroyan and youngest daughter of a pioneer ranching family. Her great-grandfather, Mathias Fellom, a Danish immigrant and one of the earliest settlers in the region, worked with John Gilroy, founder of the town, n the early 1800s. Her father, William Fellom, and grandfather, John Fellom, were long time Gilroy ranchers and her mother, Dorothy served the Gilroy community during her career as a Registered Nurse. Barbara graduated from Gilroy High School and Heald Business College in San Jose. In 1950 she married Frank J. Marymee at St. Mary’s Church in Gilroy, where her parents married in 1925. Barbara and Frank made their home in the San Jose area until he passed away in 1966. A young widow, she lovingly raised their five children as well as one of their nephews. In 1974 she married Vaughn L. Tuttle of Salinas who predeceased her. Barbara later moved to Portland OR where she worked until retirement for the Oregon State Employment Dept. Barbara enjoyed gardening, camping and the beach, spending time with family, and caring for her cherished little dog, Lilly. Barbara is lovingly survived by her four daughters, Shirlie Marymee of Sacramento, CA, Frances Sipe ( Bill ) of Tigard OR, Cynthia Marymee of Hollister, CA, and Therese Walker ( Steve) of Aiken, S. Carolina, grandchildren Brien Sipe, Lyndsey Sipe and Madelynn Walker, and her brother William J. Fellom of Hollister. She was predeceased by her son Daniel Marymee, her brother Wayne Fellom and nephew Patrick Marymee. She is the cherished aunt to James Marymee, Maureen Marymee, Michael Marymee (Terri ), Timothy Fellom (Kim) and Julie Fellom and great aunt to several great nieces and nephews. Private services were held in Portland Oregon. 957 MOR Public Notice ORDINANCE NO. 2300, NEW SERIES AN ORDINANCE OF THE CITY OF MORGAN HILL APPROVING A DEVELOPMENT AGREEMENT DA20180007: DEPOT-LATALA FOR A 49-UNIT MIXED USE DEVELOPMENT LOCATED ON THE EASTERLY SIDE OF DEPOT STREET NORTH OF EAST DUNNE AVENUE (APN 726-13-049) NOTE: The above is a Summary of Ordinance No. 2300 introduced by the City Council at its regular meeting of March 20, 2019 by the following vote: Ayes: Carr, McKay, Constantine; Noes: Martinez Beltran; Abstain: None; Absent: Spring. This Ordinance is scheduled for adoption at the regular City Council meeting of April 17, 2019. A reading of the entire Ordinance may be necessary to obtain a full understanding of the provisions. For further information, please call the Office of the City Clerk at (408) 779-7259. This summary is prepared by the Office of the City Clerk pursuant to Government Code Section 36933. NOTE: The above is a Summary of Ordinance No. 2301 introduced by the City Council at its regular meeting of March 20, 2019 by the following vote: Ayes: Carr, McKay, Constantine, Martinez Beltran; Noes: None; Abstain: None; Absent: Spring. This Ordinance is scheduled for adoption at the regular City Council meeting of April 17, 2019. Mon-Fri 8am-5pm regular hours only and does not include holidays, weekends, or emergency rates. ERNIE’S PLUMBING & Repair Service Inc.
Best Plumbing Service in Town! Quality Work, Reliable Service. COMMERCIAL & RESIDENTIAL ALL WORK GUARANTEED! CineLux Gilroy Café and Lounge Opening Soon! NOW ACCEPTING APPLICATIONS FOR OUR WAITING LIST Prospect Avenue Sr & Prospect Villa I 190 E. Park Street Hollister, CA 95023 1 bdrm apts & also apts w/special design features for individuals with a disability. Must be 62 years of age or older; or disabled, regardless of age. Inquire as to the availability of subsidy. Call (831) 638-1651 Mon-Fri. 1pm to 5pm TDD# 711. This institution is an equal opportunity provider and employer. EQUAL HOUSING OPPORTUNITY. EQUAL OPPORTUNITY ACCESS. age. Inquire as to the availability of subsidy. Call (831) 636-1997 Mon-Fri. 8:00AM -2:30PM, TDD# 711. This institution is an equal opportunity provider and employer. EQUAL HOUSING OPPORTUNITY. EQUAL OPPORTUNITY ACCESS. GARAGE SALES MOVING SALE April 20 9am-6pm Lots of various household items. 18271 Carriage Drive, Morgan Hill. SMALL FOOD EQUIPMENT MANUFACTURER in Hollister seeking laborer to provide general shop support (i.e., grinding, cleanup, loading/ unloading materials, etc.). Willing to train! Please respond to this ad via email to femco@razzolink.com. BENITO VALLEY FARMS INC. is seeking an Agricultural Chemist in Hollister, CA. Bachelor in chemistry or biology is required. Duties are to conduct surveys, perform chemical analyses & experiments to improve soil fertility & composition. Mail resume to Benito Valley Farms Inc. at 8100 Frazier Lake Rd., Hollister, CA 95023. NOW ACCEPTING APPLICATIONS FOR OUR WAITING LIST Lado Del Rio Apartments 901 Del Rio Dr., #D, Hollister, CA 95023 1, 2, & 3 bdrm apts & also apts w/special design features for individuals with a disability. Inquire as to the availability of subsidy. HELP WANTED Office/Clerical Call (831) 637-0657 Clerical Person needed from Post your yard sale, Bubbles_quarter_419.pdf home rental, 1 2/12/19Mon-Fri. 2:50 PM to 5pm 8:00pm repair service, job opportunity, Monday-Friday, $500 weekly cusTDD# 711.PM This institution is an automotive salesBubbles_quarter_419.pdf and more. 2:50 tomer service skills,1some2/12/19 cash & equal opportunity items handling skills, Apply email: marketplace.gilroydispatch.com provider and employer. uphigher77@gmail.com marketplace.sanbenito.com OPPORTUNITY. Bubbles_quarter_419.pdf 1 2/12/19 EQUAL 2:50HOUSING PM marketplace.morganhilltimes.com EQUAL OPPORTUNITY ACCESS. 16 “The African Queen” screenwriter James 17 Abundant harvest 19 Sell by machine 20 Dabblers 21 Dazed state 23 Shirt size: Abbr. We offer: Free estimates and gift certificates We offer:available. Competitive Pay, Great Benefits & Growth! NOW ACCEPTING APPLICATIONS FOR OUR WAITING LIST Prospect Villa III 960 Prospect Ave Hollister, CA 95023 1 bdrm apts & also apts w/special design features for individuals with a disability. Must be 62 years of age or older; or disabled, regardless of age. Inquire as to the availability of subsidy. Call (831) 683-1651 Mon-Fri. 8:00 am -12:00 pm, TDD# 711. This institution is an equal opportunity provider and employer. EQUAL HOUSING OPPORTUNITY. EQUAL OPPORTUNITY ACCESS. 60 No longer working: Abbr. #1 paCiFiCa hYBriD DeaLer in The WorLD! #1 PACIFICA HYBRID DEALER IN THE WORLD! • #1 PACIFICA HYBRID DEALER IN THE WORLD! $6,888 DeaLer DiSCounT $1,000 ChrYSLer paCiFiCa hYBriD ConqueST BonuS CaSh** $1,000 ChrYSLer Ca BC ConSuMer CaSh*** ***ReSiDency ReStRictionS aPPly. *tax cReDit RangeS fRoM $0 to $7,500. actual SaVingS fRoM the feDeRal goVeRnMent DePenD on youR tax Situation. check feDeRal anD State weBSiteS RegaRDing eV incentiVeS aS they aRe SuBJect to change with little notice. conSult youR tax PRofeSSional foR DetailS. **MuSt cuRRently own oR leaSe a non-fca hyBRiD, Plug-in hyBRiD oR eV Vehicle. tuRn-in oR tRaDe-in not RequiReD, cuRRent RegiStRation RequiReD. autoMatic 3RD Row - 7 PASSeNgeR! *ReSiDency ReStRictionS aPPly. **a qualifieD coMMeRcial cuStoMeR that iS cuRRently in BuSineSS foR MoRe than 30 DayS PRioR to the Date of Vehicle PuRchaSe iS eligiBle foR the coMMeRcial incentiVeS. See DealeR foR DetailS. #1 PRoMASteR CitY DeALeR iN CA* *PeR FCA SALeS RePoRt oCt. 2018. *ReSiDency ReStRictionS aPPly. **foR fico ScoReS Below 620. 30 otheR PRoMASteR CitY to ChooSe FRoM! neW 2018 raM proMaSTer CiTY greaT For SMaLL JoBS! 5 at this Net Price! *ReSiDency ReStRictionS aPPly. **foR fico ScoReS Below 620. ***MuSt finance thRough chRySleR caPital, SuBJect to cReDit aPPRoVal. WIreless phOne COnneCTIvITy, exTerIOr reAr pArkIng CAMerA, perIMeTer/ApprOACh lIghTs & MOre! oveR 160 otheR 1500 RAM CRew to ChooSe FRoM! oveR 30% Net SAviNgS oFF MSRP! *ReSiDency ReStRictionS aPPly. **foR fico ScoReS Below 620. ***MuSt finance thRough chRySleR caPital, SuBJect to cReDit aPPRoVal. ****on Select unitS in DealeR Stock. fRont Dual zone a/c, heateD DooR MiRRoRS, low tiRe PReSSuRe waRning, PaRkView ReaR Back-uP caMeRa & MoRe! *ReSicency ReStRictionS aPPly. **foR fico ScoReS Below 620. ***MuSt finance thRough chRySleR caSPital, SuBJect to cReDit aPPRoVal. 2019 DoDge Durango SXT AUTOMATIC, AUTOMATIC TeMperATUre COnTrOl & MOre! 1 at this Net Price! Fast ‘n Furious Sales event - as Seen on Tv! *ReSiDency ReStRictionS aPPly. ** foR fico ScoReS Below 620. ***MuSt finance thRough chRySleR caPital, SuBJect to cReDit aPPRoVal. 36 Month leaSe, $3,000 total Due at Signing incluDeS $0 SecuRity DePoSit, tax anD licenSe not incluDeD. 10,000 MileS PeR yeaR, $.25 PeR Mile theReafteR, SuBJect to cReDit aPPRoVal By chRySleR caPital. DUAl zOne AIr COnDITIOnIng, leATher sTeerIng Wheel, OverheAD COnsOle, reMOTe keyless enTry & MOre! *ReSiDency ReStRictionS aPPly. **MuSt own oR leaSe a non-fca llc. SuV, tuRn-in oR tRaDe-in not RequiReD, cuRRent RegiStRation RequiReD. 2019 Jeep Cherokee WIreless phOne COnneCTIvITy, exTerIOr reAr pArkIng CAMerA, perIMeTer/ApprOACh lIghTs & MOre! *ReSiDency ReStRictionS aPPly. **foR conSuMeRS with fico ScoReS Below 620. ***MuSt finance thRough chRySleR caPital, SuBJect to cReDit aPPRoVal. *PER FCA SEPT 2018 Net Sale Prices and Factory Rebates in lieu of Special Finance, Lease and Fleet offers. † Factory consumer cash rebate in lieu of discount financing on approved credit. *Must finance through Chrysler Capital, not all customers may qualify. All prices exclude government fees and taxes, any finance charges, any dealer document processing charge, any electronic filing charge and any emission testing charge. Residency restrictions apply. See dealer for complete details. Vehicles pictured use for display purposes only and may vary slightly from the actual vehicle. All vehicles subject to prior sale. Not responsible for typographical errors. Sale prices end 4/15/2019.